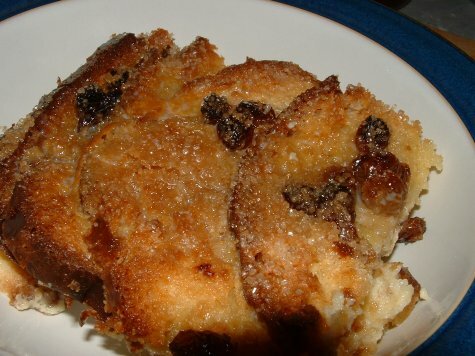 Thanks to Rachel who sent me a recipe for bread pudding that I am trying for the first time today. It is one from a BBC America TV show that she happened to catch one day. It seemed interesting to her so I am giving it a try. The first thing I had to do was to convert all the metric measurements to the standard ones with which I am familiar, grams to ounces, Centigrade to Fahrenheit, etc. Then I had to find out what castor sugar and demarara sugar are. Castor sugar is extra-finely granulated white sugar. You can make your own with a food processor by grinding regular white sugar for a few seconds. Demerara is a brown sugar also granulated, but slightly coarser than white sugar but not as coarse as turbinado sugar. At least that’s what I think they are based on what I could find out on the internet. There are websites that can convert metric measures to US friendly measures. I found a handy conversion calculator for degrees Celsius to degrees Fahrenheit and vice versa. I used regular white sugar for the castor sugar and I ground up some Turbinado in a coffee bean grinder to make a substitute for the demerara. As my luck would have it, the grinder had last been used to grind up some herby concoction and smelled of savoriness unsuitable for mixing with sugar. I had to clean it out by grinding some white rice. That should serve as a lesson for us all. Clean up as you go. Unfortunately, when preparing a meal there is enough to do without remembering the benefits of grinding white rice in a coffee grinder before putting it away. Anyway, I wound up with a weird textured brown sugar and I had no idea whether or not it would be adequate. A check of the recipe told me that it was just to be sprinkled on the top of the pudding so I figured it wouldn’t matter too much whether I had ground it or not. Another lesson: read the entire recipe carefully before proceeding. I would have saved myself some trouble. Of course, I did get the coffee grinder clean. Double cream isn’t readily available in the US. I used heavy cream with somewhat less butterfat than double cream has. It is possible to make a closer substitution but I didn’t want to go to that trouble. The rest of the ingredients were pretty standard. Baileys Irish Cream was one of the ingredients. I had both Baileys and Brogans. I used the Brogans because I don’t like it as a drink quite as well as Baileys. It was just a flavoring for the pudding, after all. After baking, and glazing, the pudding rested for a while and I had lunch. For dessert I had warm bread pudding and it was very tasty. I would definitely make it again. 1. Use butter to grease the sides of a 1.5 litre shallow ovenproof dish. (I used an 8 X 8 pyrex dish.) Spread 2-3 teaspoons jam on the bottom of the dish and sprinkle some of the fruit on top. 3. Arrange the bread in the dish in overlapping layers, sprinkling the dried fruit between. 4. Beat the eggs, yolks and sugar together until creamy. Then beat in the cream, milk and Baileys. 5. Slowly pour this mixture over the bread. 6. Press the bread down gently with your fingers so they are completely submerged. 7. Let stand for about 20 minutes to allow the bread to soak up the custard. 10. Sprinkle the pudding with the demerara sugar and bake for 40-50 minutes until golden brown. 11. Shortly before the time is up, warm the apricot jam until runny. 13. Trickle a little more Baileys over each portion to serve, if desired. Note: I tore up the bread slices so that they would fit in the pan more easily, and it worked out fine. Tonight we are having stuffed green peppers, one of my favorite dinners. I’ll probably make a little garlic bread since I have a baguette on hand to make bread pudding. I purchased a marinated vegetable salad at the grocery. It’s something new in their deli and I though I’d give it a try. 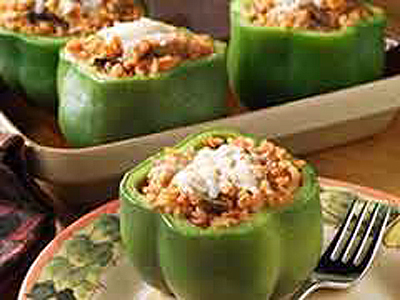 My recipe for the stuffed peppers is just a generic one, nothing special, no exotic ingredients. I stuff the pepper halves with ground beef, cooked with chopped onion and a little bit of chopped green pepper trimmed from the tops of the peppers when I halve them. I add a can of diced tomatoes, some rice, worcestershire sauce, salt, pepper, a little water, and some shredded cheddar. Sometimes, I add a cup of so of corn mixed into the meat and rice. I think my recipe is from an old Better Homes and Gardens, or an old Betty Crocker cookbook. When I think of summer meals, I always think of stuffed green peppers. We like them in the middle of summer, with fresh tomato slices, and corn on the cob. I’ll have to wait a few months for that, I guess. I have been trying to incorporate more fruits and vegetables into our meals, as I mentioned in a post last week. Can I say we are noticeably healthier or happier or prettier or peppier? Not yet. I suspect it’s one of those lifestyle things that is apparent when you have committed yourself to a dietary alteration for a period of years, not weeks. Oh well. I’ll keep at it. We had pork chops tonight, nothing fancy, just chops quickly fried in a skillet. As side dishes, we had roasted new potatoes with garlic chips, steamed broccoli with Parmesan cheese, and tossed salad with red grapes and vinaigrette. For the potatoes, I washed a double handful of medium-size new potatoes and cut them in quarters. I dried them well and tossed them with a tablespoon of olive oil and some salt and black pepper. Then I peeled and thickly sliced four garlic cloves and tossed them into the potatoes. I put it all in a shallow baking dish and into a 375 degree oven. It took about 35 -40 minutes for them to roast. The garlic slices were nicely browned and crunchy. If my rosemary hadn’t frozen this winter, I would have added some to the dish. The vinaigrette was just an ordinary oil, vinegar, little dijon, salt and pepper mixture. The addition of the grapes gave a sweetness to the tangy dressing. Very good. I must tell about my misuse of rosemary a few years ago. We were preparing for our annual Christmas Eve feast with family and friends, a go-all-out dinner with either rib roast or beef tenderloin every year. Certain constant items include baked stuffed potatoes, broccoli-cauliflower salad, and the piece de resistance, Buche de Noel. I usually prepare the Buche de Noel the day before and at that time, I had some extra time and made meringue “mushrooms” to garnish the platter when presenting the Buche after dinner. I also sprinkled some cranberries around the platter and, to make it even prettier, I decided to add a few sprigs of fresh rosemary. Big mistake. It wouldn’t have been so bad if I had put the rosemary on the platter immediately before serving dessert, but I put it on the platter the night before and stored it in the spare refrigerator. By the time dessert was served, the pungent fragrance of rosemary had permeated the icing and cake. Now, I like rosemary, but not in chocolate icing, and definitely not in sponge cake. We all had a good laugh and I learned a lesson about garnishing. My knitting buddies and I met for LM’s birthday lunch today at Mimi’s Cafe. It is a chain of restaurants spread across the US. We have been to the one here and one in Knoxville, Tennessee. Judging by the packed parking lots, it is always a popular place. The menu is large, but not confusing. The food is eclectic, with seasonal specialties, and downhome favorites. I understand the Chicken Potpie is a perennial favorite. Mac enjoyed the potpie when he ordered it in Knoxville. I have had the Thai Chicken Wrap, the Club Sandwich, and one of today’s seasonal featuress, the Pan Seared Scallops. It was a pasta dish with large scallops, mushrooms, sun dried tomatoes, spinach on fettucine with a tomato cream sauce. It was delicious. The price was reasonable for the amount of food received. Our bill for 2 sodas and three lunches was under $30. My only complaint is that the room we were in was too noisy. There were three of us at a square table and we could hardly hear one another without shouting. Next time we will try a different room. Perhaps we will request a booth. I wouldn’t hesitate to recommend Mimi’s Cafe to anyone. Last night we had the chicken that I told you I would fix. It was really simple and very good. When Mac’s potato was nearly done baking, I had the stewed tomatoes simmering on the stove and the spinach ready to cook in the microwave for a few minutes. To prepare the chicken, which was already pounded to an even thinness of about 1/2 inch or less, I dredged it in a mixture of flour, salt and pepper and a spice/herb mixture that I had prepared and stored in an empty spice jar earlier this year. If I can find the combination, I will give it to you later. I heated up a tablespoon or so of olive oil and placed the chicken breasts in the pan. I cooked them over medium to medium high heat on each side for 3 minutes and then 1 more minute on each side while I zapped the spinach in the microwave. The chicken was perfect, still moist, but thoroughly cooked. I think that most people, in their fear of undercooking chicken, overcook it and therefore it gets too dry. You can always return the chicken to the heat if a small cut in the thickest part shows that the juices are still pink. If necessary, it can be microwaved to finish it, although that would be a last resort for me. Once you use the trial and error method a few times, and keep notes on time and temperature, you can rely on perfectly cooked chicken every time. You can buy chicken breast already boned at the grocery. My local Kroger often has a “buy one, get one free” deal on boneless breasts. I take advantage of it and pound the breasts as soon as I get them home, wrap them individually, bag ’em up, and stick them in the freezer. Then, a quick thaw renders them ready to cook in a flash, inside or on the grill. Marinate them for a while in your own recipe for marinade, or use bottled salad dressing if you want, cook them, and serve them over salad greens. Alongside sauteed or grilled vegetables. The possibilities are nearly endless for a quick, tasty chicken dinner. Tonight we are having flat chicken. It is a weird looking bird whose poor mangled body looks like it was run over by a truck. It isn’t boned, exactly, but the backbone is either gone or broken so that the whole chicken lays flat. It is ready for grilling, or roasting. I am going to roast the bird. It has been marinating in a garlic and herb concoction and should taste great. With it, we are having cooked carrots and broccoli, with brown and wild rice – maybe a salad, if I quit blogging in time to prepare one. I’ve been reading the book on the Sonoma Diet. It’s one that stresses eating the best foods, nutritionally speaking, instead of avoiding “bad” foods, ie., refined sugar, saturated fats, etc. As a result of reading the book, I am going to make a concerted effort to incorporate as many of the “power foods” recommended in the Sonoma Diet. Every now and then I come across a list of the “best” foods from one authority or another. There are always some of the same foods on each and every list; broccoli is one and blueberries another. Usually beans and cantaloupe appear, but they’re not on the Sonoma list. Yesterday I bought blueberries and strawberries. We already have broccoli on hand as well as the rice. This week I will pick up some spinach, more tomatoes, grapes, and peppers. We usually have tomatoes and olives on hand and I almost always use olive oil instead of any other kind of oil. I use canola oil sometimes if I don’t want the olive oil flavor in a salad dressing. We ate the remaining almonds today so I must remember to stop by the “Nut House” and get more. We have a nut roasting plant in town and when I am walking or riding my bike, I often catch the aroma of roasting nuts and it makes me hungry. I’ll let you know how we are doing eating the top ten list of foods. I’m left with garlic to discuss today as the “G” vegetable because I can’t find any other vegetable that starts with a “G” except globe artichokes and ginger. I know nothing about globe artichokes and may feature ginger if I blog about herbs and spices. I don’t mean to imply that garlic isn’t a worthy topic. In fact, just the opposite is true. I love using garlic and can’t imagine cooking without it. 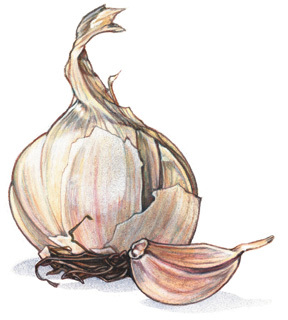 Like many cooks, I started my love affair with garlic knowing only about garlic powder or garlic salt. I don’t suppose I ever saw a head or clove of garlic until I was 25. I now know that the taste of the powders and salts are nowhere near the same as that of the real McCoy, and I make sure that I have at least 2 heads of garlic in my pantry at any time. Although used primarily as a seasoning or condiment, it is also the basis of some recipes. The city of Gilroy, California, (“Garlic Capital of the World”) observes a Garlic Festival every summer and culinary specialties featuring the “Stinking Rose” infuse the air with the scent of garlic. Two tons of fresh garlic appear in food dishes prepared by the 4,000 volunteers. These dishes run the gamut from soups to desserts as entrants from across the US and Canada submit their favorite garlic recipes to be judged each year. Last year’s winning recipe was Proscuitto Wrapped, Roasted Garlic, Fest & Rosemary Stuffed Mushrooms. It sure looks like it should be a winner! I’ll try it sometime. I use garlic to flavor mashed potatoes as do many people. I found it not necessary to chop or mince the peeled cloves before cooking. I just throw them in the pot of water with the potatoes and they tenderize and get mashed when the potatoes do. Here is a recipe for garlic soup from Gourmet magazine, MAY, 1994. Combine first 4 ingredients in medium saucepan. Bring to boil. Cover, reduce heat to low and simmer until vegetables are tender, about 25 minutes. Puree in batches in blender. Season with salt and pepper. Rewarm over medium heat. Drizzle with cream, if desired. I have made garlic soup before, but I don’t know it the above recipe is the one I used. If I were to use this recipe, I might be tempted to use chicken broth in place of some of the water. I’ll try it someday. In the meantime, tonight’s chicken breasts will be flavored with garlic, parsley and lemon. That should keep me safe from vampires for the night.